Flat netting is one of my favorite beading techniques. It’s fun and easy, and totally versatile, although not in quite the same way as other flat stitches. Netting can only be stitched and used in so many ways, but the combinations of bead types and quantities create endless possibilities. 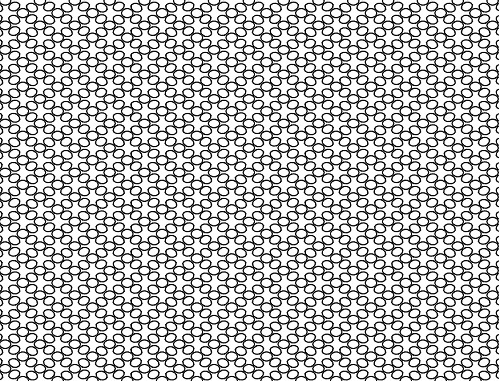 Netting is an expanded variation of peyote stitch. Instead of picking up just one bead at a time, you add several, but the rows are connected by a single bead or group within each addition. These shared beads, or anchor beads, are what hold even the biggest bead nets together. One other difference between netting and peyote is the requirement of turns at the end of each row. With peyote, you start a new row simply by flipping the work and adding the next bead. With basic netting, you must add a stitch that will redirect your thread, such as a picot or loop, which differs slightly from the main beadwork. The netting itself can also be worked in a variety of ways, with different bead counts creating new effects. When using the same number of beads for each row and column, you get a pretty openwork panel that is perfect for bracelets and cuffs. This bead netting graph from About.com Beadwork gives a great example of basic flat netting. And because the stitches are so small, you can incorporate graphic patterns to the beadwork, just like peyote or herringbone weave. Apart from freeform netting, my favorite use for the stitch is netted collars. They are so elegant and pretty, and a fun way to play with pattern and color. We’re going to look at two variations of curved netting that show different examples of turns and patterns. The curve is created simply by making the outer row wider than the middle rows. The first thing you must do before you begin is sketch out your pattern. Even if you plan to use the same color and stitch size throughout your project, you want to make sure that you begin in the right place, and pick up the correct number of beads. The more complex you pattern, the more useful your sketch will be. Here are a few examples of some of my actual netting sketches on bits of scrap paper. After deciding on a pattern for the netting, assigning the type of turns and number of nets per row, it is easy to determine where the thread should begin, which then tells you how many beads to pick up to start. The start point for your thread can vary depending on the type of turn stitch you want to use at the outer edge of your collar. From there, you pick up everything on the first line, to the point where the first turn ends (highlighted in yellow). Once you know where to begin and where you’re going, attach a stop bead with a generous tail (about 10 inches) to your thread, and string the first set of beads. This collar will have a looped outer edge, and picots on the inside. String the first sequence, then skip the last bead added and stitch back through the next bead to form the picot. Pick up beads in the correct pattern to form the second half of the top net. Stitch down through the shared bead and pull snug. When you’re getting started with netting, it’s a good idea to check over your work often, and make sure that you have the correct number of beads, and have stitched through the anchor bead. Using a different color or size for shared beads is a great way to highlight them, and makes the work go much faster. Pick up the next set of beads to finish the row, and pass through the first bead to close the net. When making the turn, you must pick up the loop beads, and the next sequence of netting beads. You might think of it as adding an extra bead to the first row of peyote stitch to form a fringed edge. Pick up enough beads to form a loop that is slightly wider than your nets, and the next net sequence. Stitch up through the first shared bead from the previous row and pull snug to close. Add the next net, then pick up a stack of beads and add the picot finish. Continue moving up and down the rows in this manner until your collar reaches the desired length. This pattern uses the criss-crossing lines of the netting to create diagonal rows within the beadwork. Unless your pattern is very complex, once you get the first few rows done, you may find that you no longer need to refer to your sketch for help. The patterns can be quite rhythmic, and if you get lost, all you have to do is refer to the previous rows to find your place. This collar is the reverse of the first example, with pointed outer nets and loops on the inside. It is also an example of a few netting mishaps, and how to correct them. String the first bead sequence, and pass through the closest shared bead to form a loop. Pick up the next half of the following net, and pass through the next shared bead to close it. Pick up a stack of beads to form half of the first picot, and pass back through the second-to-last bead. Pull snug to lock everything in place. As you can see the first net is only half finished, and doesn't match the other net. This can happen even when you plan out your pattern with a sketch, and is where the extra long tail comes in handy. When your collar is complete, use the original tail thread to add stitches that will make your first and last rows match. Add the next two sets of beads, then the loop. Pass down through the closest shared bead to close. Continue adding rows until the collar reaches the desired length. After adding a few inches of beadwork, check the curve of your collar by laying it on a piece of paper. Trace the shape of the inner curve, then use this line as a guide to determine how wide the collar’s opening will be. If your netting is too tight, the curve might be too pronounced to fit around the average neck. It’s better to find out early on, so you can start over with less hassle. If you get too far into a collar to rip out stitches and start again, you can always improvise. If the curve is too tight, use the beadwork as a pendant, and attach it to chain or spiral rope for a fun bib necklace. This collar is an example of not enough curve - the inner row is almost the same width as the other rows. Therefore, the beadwork is almost completely flat, and because it is so wide, it doesn’t curve into a circle very well. The solution? Extender chains. Although I added extenders to both of these collars, it was completely necessary for the yellow and back variation, in order to make it drape correctly. Ready to give it a try? Once you get the basics down, it’s fun to experiment with different patterns and accent beads. 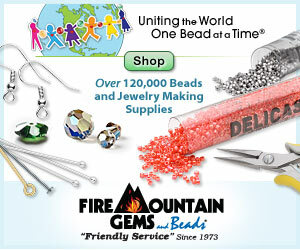 Netting works very well with crystals, drop beads, daggers, tubes, bugles, and lots of other basic bead shapes. All so very pretty! Have not tried a collar yet. I love tubular netted bracelets as well. I love your idea of sketching out the netted pattern. I've never tried that, but I'll have to give it a whirl. I love netting...so many possibilities and your variations are beautiful! As usual, your tutorial is a marvel of clarity and helpfulness. I have done many netting stitches, but I never thought of them as a variation of peyote before. Thanks for the clear explanation about the plotting of the curve and how it affects necklace drape. They are both beautiful and I've always wanted to learn how to do this. Thank you so much! This is a fantastic tutorial you gave. I am not sure if I am ready for it yet, but I'll take your idea of the picture or graphing for my knitted wire projects. Thank you. Muchas gracias por la explicación. Haces unos collares preciosos, enhorabuena!!! Stunning and so elegant. When I have another opportunity to go out dressy I am for sure making one like this!!!! I'm gonna try these. Especially the 2nd variation. Your works are indeed inspiring. Thanks a bunch! Sorry to say that I did not understand it at all. I will have to look on YouTube or something so I can actually watch it being done. Hopefully that will help as I am not getting it with the written directions, even with the pictures. I'm sorry that you didn't find this one helpful! This is more of an overview than a step-by-step tutorial, as there isn't one right way to do netting. I highly recommend finding a full project that you really like - once you've mastered it you can branch out and try different variations. The book Netted Beadwork by Diane Fitzgerald is an excellent place to start. You might be able to get a copy at your public library.